I think this is most teachers go-to for indoor recess. It's free. It's easy. They have soooo many fun things to choose from for your kiddos. They even have an indoor recess channel that has longer videos (about 10-11 min.) that are perfect! I think all kids like GoNoodle- even my 4 year old will do it at home watching on our TV! I don't know about you, but I remember playing lots of indoor recess games when I was in elementary school! These classic games don't get old. My students still loved playing them. 1. Heads Up, 7 Up- Basically, the teacher picks seven (or however many) kids to start, everyone puts their heads down and thumbs up. Then, the original kids quietly sneak through the room and tap one person's thumb to put down. When everyone has picked, the class puts their heads up and each person that was tapped has to try and guess who it was. If they guess correctly they get to go up to be the next picker. If not, they sit down. Then it all starts again. 2. Kings Corner/4 Corners- The teacher picks one person (I usually started with my Student of the Week). They close their eyes and count to ten out loud. Meanwhile, everyone else is silently moving to one corner of the room. By ten, everyone should be in a corner and the main student picks one corner (make sure you number corners before you start). Everyone in that corner is out and sits down. The game continues until there is one person left and then they become the "King" and you can play again. 3. Eraser Tag/King Chases Queen- Pick one boy and one girl and have each put an eraser on top of their head. Begin the game by saying "King chases Queen" or vice versa. (If you say King chases Queen then the boy will tag the girl, or the other way around.) The students WALK around the room and try to tag the other child while the eraser stays on their head. The first child to be tagged or drop the eraser is out. You can control the pace of the game by reversing the Queen chases King at any moment. When the child is tagged out they just give the eraser to another person to continue the game. Of course you could always play this by just using a child's name instead of "King" or "Queen." 4. Silent Speedball- Okay, so I used to play this during dismissal a few days a week when they would call kids via our TV. The kids LOVED it and it was always silent so everyone could hear when their bus was called or they were being dismissed. You just need to make sure you have a SOFT ball (like a foam ball or nerf ball). All the kids would stand behind their desks and spread out around the room accordingly. Then they would toss the ball to each other. Everything was done silently, so they had to pay attention and make eye contact so the student knew when the ball was going to be tossed to them. If they caught it, they tossed it to a new person. If they missed it, they sat down. The game was over when there was only 1 person left. My only other rule when playing was that you couldn't throw the ball back to the same person that threw it to you. You do have to somewhat monitor this game because if there is a really bad throw, and it wasn't caught, I would have the thrower sit out. After we played this enough times I was able to set up a monitor and they did the job of being the judge, so I was able to get other paperwork things done during dismissal or indoor recess time. 1. Board Games/Puzzles- If I chose to use board games and puzzles, I would usually set them up as small group centers to keep the voice level and mess to a minimum. You can find lots of games to use for this at garage sales or have them donated by families from students. 2. Legos- Everybody loves them! Again, usually in small groups and I would find them at garage sales and put them in a huge bin. 3. Math Manipulatives- My kiddos loved be able to use and play with all different kinds of math manipulatives. I could just give free play with geoblocks, square tiles, pattern blocks, cubes- they would play with them all! If you want more direction you can have pattern block design sheets (you can find lots on the web) or design sheets or idea sheets that go along with the different manipulatives. 4. Math Games- I don't know about you, but I used A LOT of different math games throughout the year. 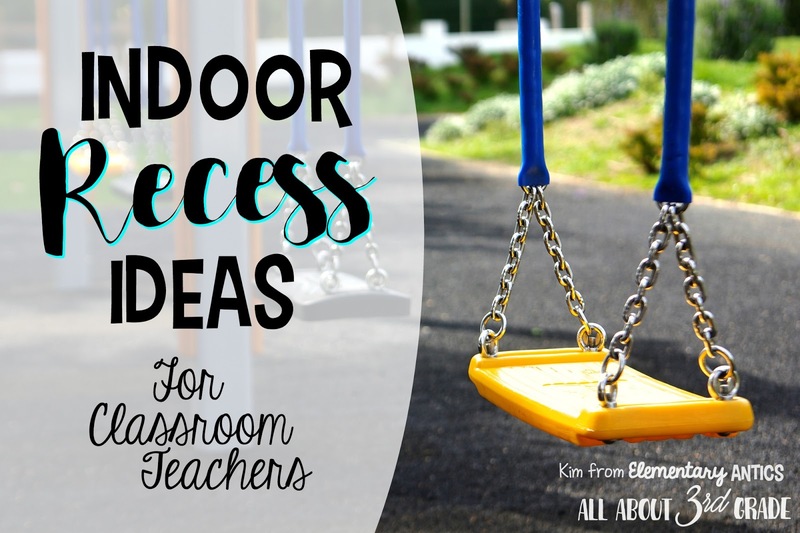 Almost any math game you've already taught could be a fun indoor recess. The kiddos can grab a partner or two and find a comfy spot in the room and get playing. A lot of my math centers have fun games that you could use too! I hope this helps you fill in the time and have some fun the next time you have indoor recess!